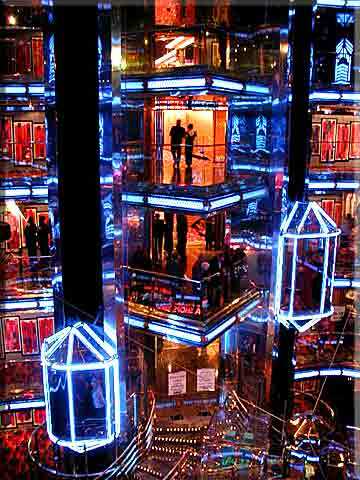 The ship cruised at night and was in port on two of the four days. There was always a list of choices for port tours, snorkeling, scuba diving, glass bottom boats, shopping and other activities. Aboard ship, there was a further list of activities, including golf lessons, facials and massages in the spa, ping pong and shuffleboard tournaments, the pool and a large waterslide going into the pool and so on. 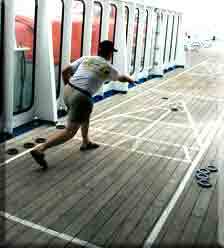 An extensive workout gym looked out the front windows of the ship, and a rubber composite track circled the top deck. An art auction one afternoon had hundreds of selections. A Picasso woodcut engraving went for $12,000, but most of the works were lithographs, some of famous artists, which usually went for about $200- $500, about what the frame would cost. There was karaoke each evening, and some of the singers were very good. At night there was music in three or four locations, which spanned disco to '60s rock music to classic and contemporary jazz. There was also a rock band by the pool in the afternoon. Late at night there were skits and games each night, such as the ship's version of, "Survivor," a "Teen Idol," competition and other invariably hilarious put-ons. There was a full schedule of activities for children and teens, and a complimentary nursery for two year olds and up. They had their own playground equipment, a wading pool, and Macintosh computers with kids games. Baby sitting for infants was available. The ship's newspaper slid under the door each evening, and covered the next day's itinerary. Over all, we felt that we had a fabulous vacation. The ship's staff were professional and handled its guests smoothly and with flourish. The quality of the food and lodging as well as the dizzying choice of activities available made the cruise a real vacation bargain. We left well pleased and ready to try it again. I think that in a reunion setting, with a collection of friends on board, it would multiply the fun even more. Morrison Cruise Reunion- Sign up instructions for the Morrison cruise, June, 2004.
Who's coming on the cruise- This takes you to the Morrison Alumni Website.